Somthing for Metal-heads and Drokk-heads! Haven't picked up MH in donkey's (more of a Classic Rock reader these days!) but the awesome Dylan Teague Judge Dredd and Anthrax cover and poster in the February 2017 issue, will insure that I will! Great also to hear that the mag and stable mate, Classic Rock has been saved from closure by Future Publishing-the news stands would of looked pretty barren without then, especially for music lovers! 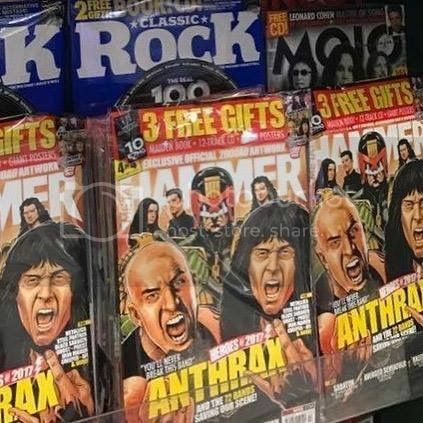 Re: Metal Hammer Judge Dredd, Anthrax cover! cool news that they have been saved I pick up Classic Rock occasionally good read, happy they have been taken over. Did Patrick Goddard not have a hand in it too? Huge aplogies, it is indeed Patrick Goddard!